Should you be making estimated tax payments? Hard tellin’, not knowin’. Fortunately there are a few quick checks to help determine if you should fork over some money to uncle Sam every few months. Everyone has to pay federal taxes on the income they receive during the year. Income can come from different places, whether that is self-employment, business earnings, interest, dividends, rent, or many other sources. If you don’t expect to have income, you are in the clear. This is an income tax after all. Most people and businesses are also subject to state income tax. We are going to focus on the federal side of estimated payments in this post, so be sure to check in with your state for details on their estimated tax requirements. If you are in one of the seven states with no personal income tax, lucky you! You don’t have to worry about making estimated payments to your state. Estimated tax is a way to pay taxes on income when you aren’t having taxes withheld from your paycheck. Typically this doesn’t apply to W-2 wage earners unless they have other sources of income (think investment or self-employment) or have mistakenly had too little withheld from their paycheck in the form of withholding tax. The IRS requires estimated taxes to be paid in quarterly (more on this below). If you file Form 1040 (income tax return) and have a Schedule C business, Schedule E rental or royalty income producing property, or pass-through income from a Partnership or S-Corporation, it is highly likely you need to pay estimated taxes throughout the year. 100% of the tax shown on your 2017 federal tax return (only applies if your 2017 tax return covered 12 months; otherwise refer to 90% rule above only). If your AGI (adjusted gross income) for 2017 was more than $150,000, substitute the 100% shown above for 110% of the tax shown on your 2017 return. If you are an employee receiving a W-2 at the end of the year, and have no other income, you probably don’t need to worry about estimated taxes. 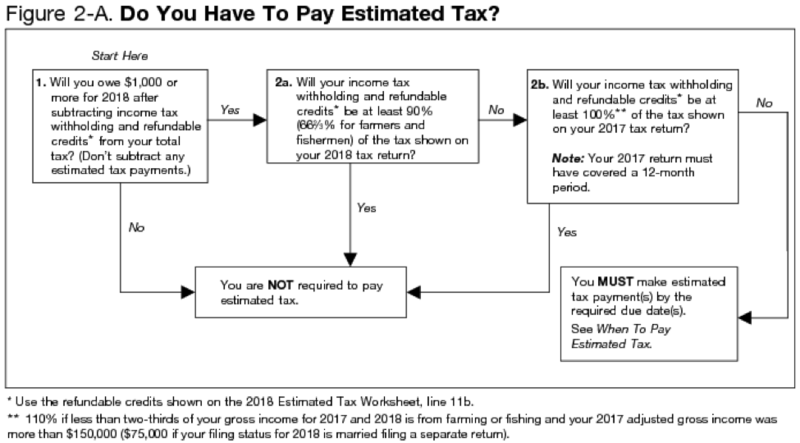 Do I Absolutely Have to Pay Estimated Taxes? The short answer is no. Some people don’t want to deal with the hassle of calculating taxes due and paying them throughout the year. This is totally fine and the choice is yours. But if you don’t make timely estimated payments, you will pay the same amount of tax due, plus more in penalties and interest at the end of the year. The penalties and interest can be substantial, depending on the amount of tax that was underpaid throughout the year. 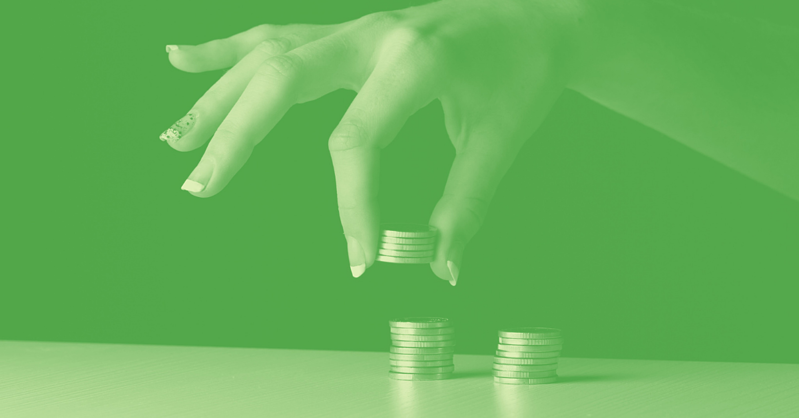 We don’t suggest avoiding your estimated tax requirements. You’ve decided you need to pay estimated taxes and you’re ready to do it. Figuring out how much to pay is the hard part. Hint: having a clean set of books makes the calculation a lot easier. The IRS has a calculator on their site to help you identify your tax withholding. The Withholding Calculator works for most taxpayers. People with more complex tax situations are encouraged to refer to Publication 505 for more detailed instructions. A quick google search will yield a few free estimated tax calculators through online tax preparation software companies. You should also talk to your accountant to see if they can help you figure out how much to pay. In the meantime, if you want to know more, feel free to reach out to us! How Do You Make an Estimated Payment? There are a few methods you can use to make estimated payments. The first and likely the easiest way for someone just starting out is the paper payment vouchers method. When you filed your taxes last year (or maybe a week ago for those extension filers out there), your accountant may have given you a paper copy of your return. Dig around in that file and see if they printed out estimated payment vouchers for you. Most accountants have powerful tax preparation software that automatically estimates your taxes for the next year based on past years' income tax filing. If you have those vouchers just send them in on the date mentioned with a check for the estimated payment amount to the address listed, and you are done! The important thing here is to make sure it is filed on time. Pretty simple. If you don’t have payment vouchers, you need to do a bit more work. Form 1040-ES. You can search for form 1040-ES online. Fill it out and send it in with your payment. This is the same payment voucher form mentioned above, but you have to fill it out and estimate your taxes due. The Electronic Federal Tax Payment System. You will need to enroll to use this service. Once registered, you can simply hop online at anytime and make a payment for free. Payments can also be made over the phone. Your account can be linked to your business so you can use your EIN to apply payments to. Through this system, you can schedule payments in advance and view 16 months of payment history. https://www.irs.gov/payments. This is another online service. It is tied to your social security number instead of your business EIN. Follow the instructions on the page to make a payment. Quick tip: Rather than taking a refund and paying it back a few days later as an estimated payment, choose to apply any overpayment of income tax from the prior year to the next year's estimated payments. When Are the Quarterly Payments Due? You’ve determined you need to make estimated payments this year, you know how much to pay, and you know how to send your money. But when are you supposed to send the payment? For estimated taxes purpose, the year is divided into four periods. These periods aren’t necessarily every three months, or quarterly. As a rule of thumb, the payment is always due 15 days after the end of the period. You Made Your Estimated Payments. What’s Next? The Bean Team’s obvious answer is to make sure the estimated payments are properly accounted for. Estimated taxes aren’t an “expense” of your business. They should be held in an equity distribution sub-account labeled “estimated tax payments.” That way your accountant can easily see what was paid all in one location. Make sure to label the payee as the IRS and put an appropriate description in the memo line. Most people need not worry about estimated taxes because their employer withholds taxes from every paycheck. But if you’re not a standard employee, and are instead self-employed as a business owner or independent contractor, there’s no one withholding taxes from your paycheck for you. That means it’s up to you to figure out just how much you should be withholding—we're happy to help you along the way.